Once your mirrors have been created, DataKeeper allows you to manage your shared volumes. By choosing Manage Shared Volumes from the DataKeeper GUI, you can add another system, which is sharing a mirrored volume, to a job. It also allows you to remove a shared system from a job. These systems can exist on either the source side or the target side of the mirror. To add or remove a system that is sharing a mirrored volume on either the source or target end of a mirror, select the job that you want to manage and highlight the mirror that contains the volume that is to be edited. If a volume is mirrored to more than one target and you want to add or remove a shared system on the source side of the mirror, you can choose any of the mirrors, since they all refer to the same source volume. 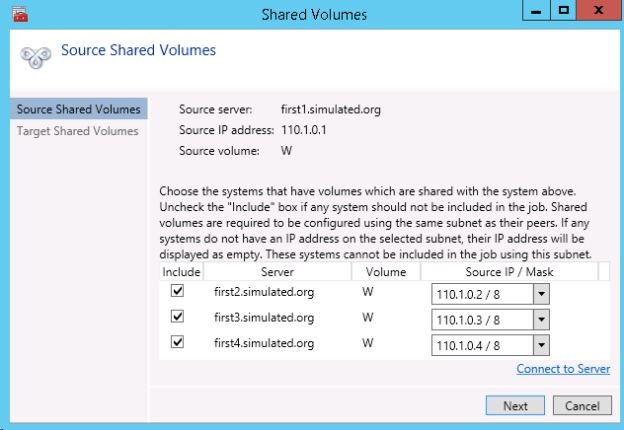 Choose the Manage Shared Volumes action for that mirror, and the Shared Volumes dialog will appear. If you want to add or remove a shared system on the target side of the mirror, you must select that specific mirror.